A set of 2 Origami Tile Drinks Coasters - handmade, with Japanese chiyogami paper on ceramic tiles. 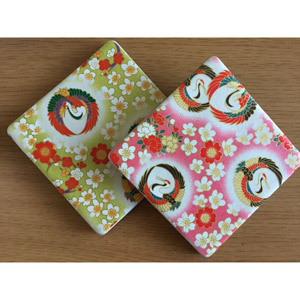 The coasters you receive may vary slightly from the examples shown in the pictures but a segment from the same patterned paper will be used. The coasters are coated with varnish and are suitable for use with cups containing tea and coffee (but not hotter items). The reverse side of the coasters are lined with a thin layer of cork. Clean by wiping with a damp cloth. Not dishwasher-proof.